Treat yourself to the one-of-a-kind sundae you can take anywhere! 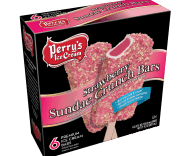 These irresistible vanilla ice cream bars have a strawberry center and delectable cake crunch coating. MILK, WATER, CORN SYRUP, CRUNCH (BLEACHED WHEAT FLOUR, SUGAR, PALM OIL, SALT, BAKING SODA, ARTIFICIAL FLAVOR, SOY LECITHIN, RED 3), LIQUID SUGAR, CREAM, COATING [SOYBEAN OIL, PALM OIL, COCONUT OIL, SOY LECITHIN, VANILLIN), SKIM MILK, BUTTERMILK, MILKFAT, WHEY, MALTODEXTRIN, ADIPIC ACID, MONO- AND DIGLYCERIDES, LOCUST BEAN GUM, GUAR GUM, CALCIUM SULFATE, CELLULOSE GUM, CARRAGEENAN, DEXTROSE, NATURAL FLAVORS, RED 40.